Math Mammoth Grade 7 Worksheets - two reproducible prealgebra workbooks for 7th grade. 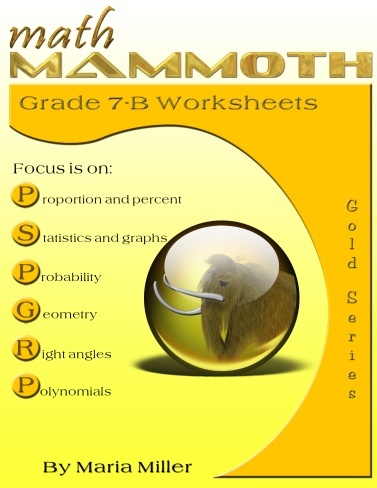 Math Mammoth Grade 7 comprises two workbooks, 7-A and 7-B, covering all 7th grade or pre-algebra topics. 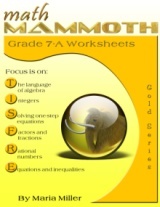 The worksheets have been created especially for teachers: each problem sheet is one page, concentrating on one topic. These prealgebra problem sheets have been "hand-crafted" one by one, and include very variable problems, including problems that emphasize understanding of concepts and word problems. 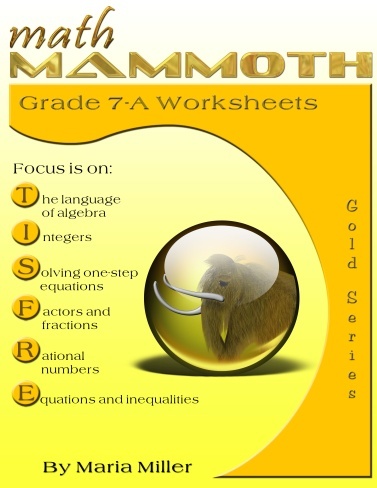 The first part of Math Mammoth 7th grade (or pre-algebra) collection contains worksheets for beginning algebra topics such as expressions (sample), linear equations, and basic properties of the four operations (sample). There is also an extensive section on integers, which includes addition (see sample), subtraction, multiplication, and division of integers, opposite and absolute value, powers with negative base, and two fact sheets that summarize all integer operations. Fraction and decimal topics are still present but not anymore with such detail as on previous grades (sample). The fraction section contains a few worksheets that touch on the concept of percent; however most of the percent related worksheets are in the 7-B collection. The section on linear equations and inequalities contains the basics of solving linear equations (sample), and as such these sheets can easily be used on 8th grade or as part of algebra course as well. This section also contains various sheets about example practical applications of linear equations. "I bought the 7th grade workbook pages. I just wanted you to know that I am thrilled with them, and that I will definitely buy the CD if I find out that I am still teaching Math next year. I can't say enough about how your design is helping my students to bridge the gap between abstract concept and visual reality. Plus, in the last few days, using your worksheets, my students have been able to work more independently. The collection 7-B starts out with ratios, proportion, and percent, which are often difficult for students. You will find many worksheets about ratios (sample), proportions and proportional reasoning, including plenty of word problems. Included are also several exploratory worksheets about slope and proportional relationships. Percent worksheets start out with a sheet that concentrates on the "nitty-gritty" of what percent concept actually is. Mental math in using percent is the focus of one problem sheet, because I feel strongly that students must not just rely on memorized procedures when doing percent problems. Doing mental math helps students understand what percent is all about. Later on the worksheets contain plenty of word problems where percent is used. Included is also a Percent Fact Sheet that summarizes how to do the basic percent calculations using either decimals or percent proportion. Statistics worksheets cover a large variety of graphs and concepts (sample), including scatter plots, box-and-whisker plots, and stem-and-leaf plots. After that come probability sheets (sample). The geometry section concentrates on constructions (sample), the concept of similar triangles and other figures, and finding areas, surface areas and volumes (sample) of basic three-dimensional figures (solids). You will again find plenty of drawing problems and word problems. The section on right triangles deals with square root and the Pythagorean theorem (sample). There is also one sheet about the very basic idea of sine as a ratio, and one worksheet on the other two trigonometric ratios. Lastly, the section on polynomials better fits 8th grade but is included here for completeness' sake. On my other website, you can generate additional, free 7th grade math worksheets to supplement this book. I really want to say a huge thanks. I have just finished downloading my purchases and I am SO impressed. I am really looking forward to using these with my girls. I know I will really enjoy using them, and I will definately be back and purchase the sets below [the Blue Series] for my 10 year old. Please feel free to use my comments on your website as an endorsement all the way from NZ. The price is also fantastic as I could not buy the same amount here for the same amount of money.